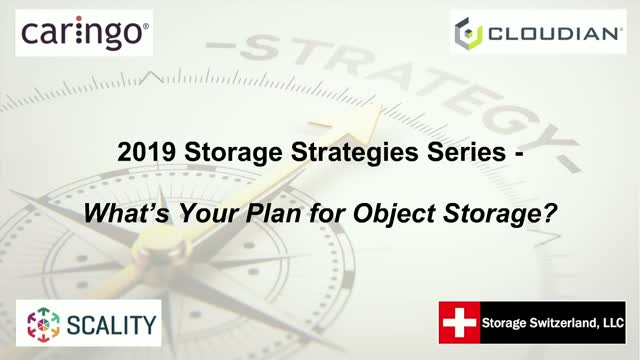 2019 Storage Strategies Series - What’s Your Plan for Object Storage? Join Storage Switzerland, Caringo, Cloudian and Scality, for a live roundtable discussion on Object Storage. Learn what you need to know to develop a strategy for object storage. Our panel of experts will discuss what object storage is, what is better/different about object storage than other types of storage and what are the use cases enterprises should consider. Our Object Storage Panel will provide specific details on how to get started with object storage, what use cases pay the most immediate return on the investment and where object storage fits in an organization's overall storage strategy. The panel will also discuss what is coming next in object storage. Each expert will also give a brief overview of their company's object storage solution. We will close out the roundtable by taking questions from our live audience. Title: 2019 Storage Strategies Series - What’s Your Plan for Object Storage?